The 3rd Annual Champagne Day on October 26th, 2012 is coming up on October 26th, 2012. All you have to do to participate is get some Champagne in your glass on October 26th 2012 and share your photos, tasting notes, experiences or videos on any social media site. Be sure to add the #ChampagneDay hashtag, so your friends from around the globe can share in the fun. To get going, here is a short introduction to Champagne. Champagne is the name of the world’s most famous sparkling wine. It is also the wine region in France from which Champagne comes and an Appellation d'Origine Contrôlée according to French Law. Pinot Noir, Pinot Meunier and Chardonnay are the primary grape varieties used to make Champagne. Champagne may be either Blanc de Noirs (made from red grapes), Blanc de Blancs (made from white grapes, most often Chardonnay - A famous example is Ruinart) or Rose, either by adding red wine to a white blend or sometimes by fermenting the juice in contact with the skins. Champagne comes with varying degrees of sweetness, due to the addition of a dosage just before the wine is finally bottled. The most common is brut, although throughout the 19th century and into the early 20th century Champagne was generally much sweeter than it is today.The sweetest level is doux and then, in increasing dryness, demi-sec, sec (dry), extra sec, brut (less than 12 grams of sugar per litre), extra brut ((less than 6 grams of sugar per litre), brut nature/brut zero/ultra brut (less than 3 grams of sugar per litre). 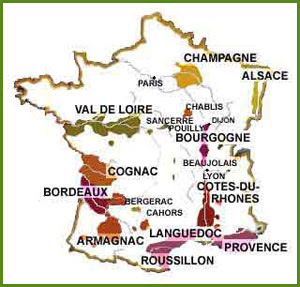 Typically, Champagne is made of still wine from several vintages (non-vintage, NV). Champagne's AOC regulations further require that NV Champagne cannot legally be sold until it has aged on the lees in the bottle for at least 15 months and vintage Champagne be aged for three years. Most top producers exceed the requirement for vintage Champagne, holding bottles on the lees for 6 to 8 years. EU law and the laws of most countries reserve the term "Champagne" exclusively for wines that come from the Champagne region. Champagne also makes still wines: Rose des Riceys and Coteaux Champenois, typically high in natural acidity. Méthode Champenoise is the (traditional) method by which Champagne is produced: After primary fermentation and bottling, a second alcoholic fermentation occurs in the bottle. This second fermentation is induced by the addition of yeast and sugars. It is this that generates the carbon dioxide bubbles responsible for the pop and sparkle that are the symbols of Champagne. After aging, the bottle is manipulated, either manually or mechanically, in a process called remuage, so that the lees settle in the neck of the bottle. After chilling the bottles, the neck is frozen, and the cap removed. The pressure in the bottle forces out the ice containing the lees, and the bottle is quickly corked to maintain the carbon dioxide in solution. Some syrup (le dosage) is added to achieve the desired level of sweetness in the Champagne. The remuage technique was invented by Veuve Clicquot and her German cellar master Anton Mueller.They revolutionized sparkling wine drinking. Until the beginning of the 1800s, the appearance of Champagne was marred by the lees, the sediment of dead yeast cells that remained suspended in the wine following the secondary fermentation in the bottle. In consuming a bottle of Champagne it was thus necessary to either decant the sparkling wine before serving it or to leave it in the glass for some time so the sediment could settle before drinking the Champagne. The remuage technique put an end to that. See: "German Wine Makers in the World: Anton Mueller Invented the Remuage Technique Revolutionizing Sparkling Wine Drinking, 1800s, France"
NM: Négociant manipulant. These companies (including the majority of the larger brands, such as: Ayala, Billecart-Salmon, Bollinger, Canard-Duchêne, Deutz, Heidsieck & Co., Henriot, Krug, Lanson, Laurent-Perrier, Moët et Chandon, Mumm, Perrier-Jouët, Joseph Perrier, Piper Heidsieck, Pol Roger, Pommery, Louis Roederer, Ruinart, Salon, Taittinger, Veuve Clicquot) buy grapes (hence négociant) and make Champagne themselves (hence manipulant). CM: Coopérative de manipulation. Cooperatives that make Champagne from the growers who are members, with all the grapes pooled together. RM: Récoltant manipulant. (Also known as Grower Champagne) A grower that makes Champagne from its own grapes. RC: Récoltant coopérateur. A co-operative member selling Champagne produced by the co-operative under his or her own name and label. SR: Société de récoltants. An association of growers making a shared Champagne but who are not a co-operative. ND: Négociant-Distributeur. A wine merchant selling Champagne under his own name, but not producing it. MA: Marque auxiliaire or Marque d'acheteur. Increasingly common, such wines are essentially own-brand Champagnes, bottled for specific retailers under a specific label (usually owned by the retailer), usually produced by a co-operative.